Been seeing features online about 600 Guadalupe (downtown block bounded by 6th, Guadalupe, 7th, and San Antonio). Initial proposal has ground floor retail with 500Ksf office below 300+ luxury apartments, but if they increase either component then the floor count could increase from 62 into the "mid-70s." Have yet to see a filing with the aviation authorities. Austin Has the bet Downtown of all the Texaplex cities. This will only make it better. Tivo_Kenevil wrote: Austin Has the bet Downtown of all the Texaplex cities. San Antonio has been rockin' a downtown gathering place for almost 300 years; it's unlike any other, and it's better. I sure do like the surge in Austin's skyline! I'd rather see a spire than a flattop, though. That Ferris Wheel craze ought to be done by now, right? Is this tower going to be a go? Can't find any additional info on it. Looks like this is still happening, planned to break ground this year. Another fresh tower in Austin, this one may be pretty nice looking and will have some interesting features. However, look at all the parking....looks familiar. Unique looking building, and with all that development they still have surface lots around. Wow Austins crushing it. How many downtown apartment towers do they have in the works? Seems like DT Dallas is behind them in this regard. Tivo_Kenevil wrote: Wow Austins crushing it. How many downtown apartment towers do they have in the works? Seems like DT Dallas is behind them in this regard. I don't know the actual number, but yeah, their Downtown area has been killing it this past decade. It's quite fascinating to watch. It's not surprising that Austin beats Dallas in this regard, because they lack other districts like Uptown, Victory Park, Deep Ellum, etc.. I guess if you took all the demand for housing in urban Dallas, and crammed it all into the CBD, you'd get something like Austin here as well, but because our urban core is significantly bigger, it's taking longer to fill out. In Austin, the majority of the height is Downtown, with not much going on outside of that. There are some high-rises in the west campus area, and some dense development going on on the east-side, but there is nothing like Uptown or Victory Park competing with their Downtown area there. I will say that I am quite envious of how many new condos are being built in Austin versus Dallas. That's definitely an area we are lacking in, and it doesn't seem to be changing anytime soon. I'm definitely happy with the way things have progressed in Dallas thus far. I like that our urban core is bigger, as it gives us more room to grow. Austin's Downtown area is quickly running out of space, which is a good problem to have, but not exactly at the stage they are currently in. I think we are close to reaching the tipping point in Downtown Dallas and, as long as the economy keeps up, we'll see some crazy growth and change over the next decade. Houston seems to be in a bit of a slump economically, and Austin is reaching a point where it's getting harder and more expensive to build, which puts Dallas in a really good position to steal the spotlight. Houston's also doing really well. Dallas does seem to be lagging in comparison. See the bottom of this page with a compilation of under construction and proposed for buildings with 500 ft+ in Dallas/Austin/Houston. The Houston and Austin CBD have always "felt" smaller than Dallas CBD, so it feels like they need to build up instead of out like they can in Dallas. In reality the loop around downtown Dallas (bounded by 35-30-366-348) is about 6 miles while the loop around downtown Houston is slightly less at 5.3 miles (10-45-69). Of course the "feeling" of a neighborhood is always different than reality. It's taken a long time for Dallas to absorb the excess in CBD, I really feel like we have just recently arrived at the point where builders feel comfortable with new product inside the inner loop. I would expect downtown to see mor in the years to come. Houston likes to build up, doesn't always mean it's good. Austin does a better job of building up and making sure everything has street level presence. It's really incredible how much Rainey St has transformed in such a short period of time. I really wonder how long it will be before these high rises start complaining about the noise from the nearby bars. I'm honestly surprised it hasn't happened already, because Rainey St. gets more loud/rowdy than Uptown, and the high rises are much closer in proximity than they are in Uptown. Parked across the street from the Sheraton this will totally dominate that area. Apple plans to build a $1 billion campus in Austin that could bring up to 15,000 new jobs, solidifying Texas as the tech giant's main employment hub outside of California. Wow, I had no idea this would be such a huge campus. The article notes that Apple already has 6,000 employees in Austin, so I'm guessing that they mean they could potentially bring an additional 9,000, which is still a massive amount. So Google is taking this entire new tower in downtown Austin. I really underestimated how much potential for growth there still is in Austin. I was under the impression that by the end of this 'cycle', they would really be struggling for space in the urban core (which would be good for Dallas as it makes our urban core more and more attractive by the day). ROFL That was a good one, Tam. Austin will overtake Dallas and Houston as the Economic Powerhouse in Texas. Tivo_Kenevil wrote: Austin will overtake Dallas and Houston as the Economic Powerhouse in Texas. I'm curious to hear why you think this is so. I think Austin will continue to have a good run for the next fiveish years, but, ultimately, I see DFW eventually coming out way ahead in the long term. I'm biased though, so I'd love to hear an opposing point of view. - Cost of living and congestion will be huge limiting factors to their growth. Dallas/Houston are also struggling with this, but Dallas/Houston also have more mature freeway/public transit systems that are better equipped to handle growth. I'm not as familiar with Houston, but I will say Dallas also has a TON of room to grow in the urban core compared to Austin. - Lack of big city amenities. Their airport is lacking compared to Dallas/Houston, and they are not included in the 'first phase' of the HSR plans. On a less important note, they also lack the types of museums and sports arenas that big cities have. Austin does have a lot going for it, but a big part of the appeal of Texas, initially, was the low cost of living. That advantage is quickly fading, so I really wonder how long Austin can continue to attract people and businesses given the rising cost of living. They do have the advantage of having UT and it really helps that it is so close to Downtown, and they have a very strong tech and startup presence. The demand is certainly there, I guess it all just depends on if they can react quick enough to absorb it all. I've been loosely following their plans to expand their rail system, but, it just seems like they can never get any traction on any of the proposed solutions. I say it because they're doing really great in the tech industry. So much so, that they've attracted the likes of Google and Apple. Look at how the tech industry has been so prosperous in the Bay area. I sense the following happen Austin. I think as CA gets more and more expensive that ecosystem will start transitioning to Austin. It's already started at a smaller degree. When that happens Austin-Round Rock GDP will sky rocket making it extremely prosperous. Yes Dallas, has more diverse Economy. But Tech is the way of the present and Future. Yeah, that's a good point. Apple and Google have started the trend, along with all the little startups in Austin, so it's very likely that others will follow suite. I'll admit, I was pretty shocked to hear about Google coming to Austin, but, now that it is official, that puts them in a REALLY good position to become the next tech hub. It would certainly be interesting to see how things pan out. If Austin blossoms into new The Bay Area, Dallas is the new Los Angeles. I think Austin is really constrained by its topography (although that is part of what makes it such an attractive place to live, as it is what gives Austin its natural beauty.) The city is really constrained on its west side due to the hill country. Traffic on 290 to reach what could be considered its western suburbs is HORRENDOUS. It's main growth direction is currently towards Round Rock/Georgetown, but that is starting to get quite a ways away from both its downtown core (and UT asset as mentioned earlier) where younger people want to live, and is even further away from its airport. Looking at the wikipedia GDP chart is interesting though... DFWs GDP grew 28 pct over that period, while Austin/RR grew 48 percent over that 5 year period, or 70% faster. Of course that increased growth rate probably isn't sustainable (and frankly DFWs 28 percent growth rate in a 5 year period itself probably isn't sustainable and is partly just attributable to the recovery from '08), but it's interesting to see how much more percent growth they've had over the period, even when compared to a national leader like DFW. ^Thanks for putting that into perspective. If 2017 Bay area still (slightly) lags behind 2017 DFW, then Austin has no chance. People might still perceive things differently though, even though GDP would clearly state otherwise. I'm pretty sure a lot of people both in and out of DFW don't exactly perceive DFW as being that high on the list economically. Looking at the wikipedia GDP chart is interesting though... DFWs GDP grew 28 pct over that period, while Austin/RR grew 48 percent over that 5 year period, or 70% faster. That doesn't surprise me all that much. It's much easier for a smaller city to grow at a higher percentage rate. Similar to how all these articles talk about how places like Celina, Little Elm, etc.. are the 'fastest growing' parts of DFW. Restrained by Topography and also the area around Downtown is a lot more built out than Dallas. You have a lot of single family house immediately outside the urban core, which can probably make development different. I agree with you, though, I think the area along Riverside towards the Airport is where we will see most of the growth going forward. I also think they will continue to sprawl north, but that gets difficult really quickly, because they already have serious congestion issues as it is. I have no doubt Austin will continue to be a powerhouse, but when you're already running into congestion and cost of living issues, it makes it a harder and harder sell compared to Dallas. The GDP thing is interesting... consider that Dallas GDP in five years ('12-'17) increased almost as much at the total for Austin in 2014. DPatel304 wrote: ^Thanks for putting that into perspective. If 2017 Bay area still (slightly) lags behind 2017 DFW, then Austin has no chance. Ah gotcha, I didn't consider that. Either way, in relation to Austin and DFW, there's no way Austin is surpassing DFW (in terms of GDP). Perhaps Austin does become the next silicon valley and does reach $776, but, even so, DFW won't remain stagnant during that time of growth. Agreed. If Austin is to ever overtake DFW and Houston to become the "economic powerhouse of Texas", it will be a very very long time from now. I believe The Independent is already completed, but is not currently included in Google Maps just yet, so it is shown as a temporary green rendering in the image. There's some serious height being added to their skyline, which must be quite excited for them (well, all the pro-growth Austinites anyway). Really, there is some crazy development going on in Austin right now. Very jealous. 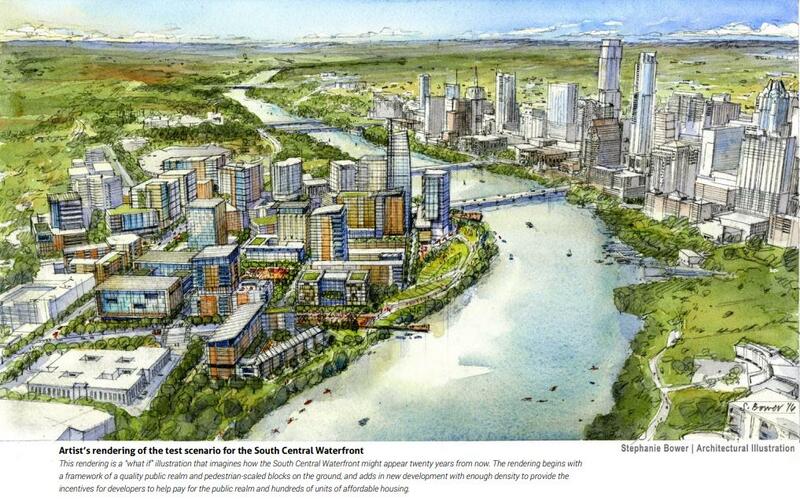 The republic is going to be a huge landmark on their skyline from the river due to its wide east-west presence. The Round Rock City Council cleared the way Thursday for a large, mixed-use development called The District. City leaders unanimously approved a development agreement with California-based Mark IV Capital, which plans to build the 1 million square feet complex on a tract of undeveloped land south of State Highway 45 and north of Greenlawn Boulevard. The city announced that the company will spend at least $200 million over the next 20 years developing The District to have office spaces and retail and housing spaces. The city will contribute more than $12 million for infrastructures like streets, sidewalks and utilities. The Domain has already done a tremendous job at attracting businesses, and now it looks like there are plans for another similar style development further up north. I'd say Round Rock might be their equivalent of Plano (well, Plano pre-Shops at Legacy/Legacy West), so this could certainly be big for them, and might give us a bit of competition in the suburban department. My main concern with anything Austin related is traffic. They can barely handle the congestion as is, and adding more jobs/residents out in the suburbs is going to put a pretty big strain on their infrastructure. This does seem like it'll be a very long-term project, so hopefully they will incorporate plans to address those issues as they come. It seems Google Inc. is making a big bet on Austin. In addition to its recent lease for an entire 35-story downtown office tower, Google will also occupy all of the office space in the Saltillo mixed-use development under construction in East Austin, according to a real estate source with direct knowledge of the new lease. Google’s latest lease is for 150,000 square feet of space in a seven-story building that’s currently under construction at Saltillo, a 10-acre mixed-use development being built between East Fourth and East Fifth streets. I was really hoping we could steal some of the tech thunder from Austin. I know people have been saying for a while that Austin is Texas's Silicon Valley, but, personally, I felt like this was a title that DFW could have 'stolen' from them as our Downtown continued to develop. With the recent announcement of Google coming to Downtown Austin, and both Austin and Amazon expanding their presence in Austin, it seems, to me, like they have solidified their status as the Silicon Valley of the South for the forseeable future. DFW is still king when it comes to overall economy, though, but Austin is certianly making the 'race' very interesting. Yet another newbie for Austin, this one 44 floors. Austins downtown puts Dallas n Houston to shame! Facts.